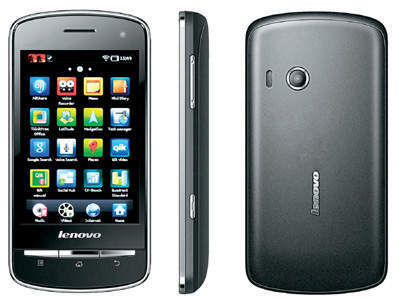 Dual SIM Android mobile is booming, Lenovo A60 series trying to enter this market presents cheap Dual SIM Android phone to date. Lenovo A60 carries a full bar design is fairly elegant, on the front side, this smartphone material wrapped with a glossy plastic material that directly cover the entire surface, including the screen. In addition there is a 3.5-inch screen and the camera lens front (VGA resolution), at the bottom of the screen there is also a shortcut softkey buttons for customization, the home button and back button. While on the back, there is only a 3.2 Mpix camera lens and single speaker holes. Then on the left side pinned the volume button and camera button. Then at the top there is the on / off button, MicroUSB port, and a 3.5 mm audio port. In contrast to the right side of the phone body is left minimalistic without instruments. Both the right side, left side, and rear material adopted dof, so it's quite comfortable grip. It is unfortunate, Lenovo A60 lies its MicroSD slot located behind the battery, meaning no hotswap. To install and remove the MicroSD card must turn off the phone first. The main reliability offered by Lenovo A60 namely the ability to dual on GSM-GSM SIM card, the SIM card which 1 is designed to serve up to HSDPA mobile broadband connections, while the SIM card 2 only for standard GSM connection. The position of the two SIM card slot is also unique, which is shaped terraced deck. 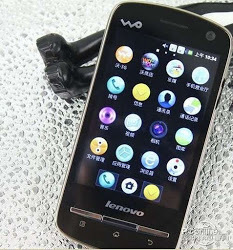 Although targeted for the middle class, the Lenovo A60 is already running on Android 2.3.5 Gingerbread OS, making the visual and performance of some applications do not look behind. That carried the camera 3.2 Mpix resolution that does not include autofocus and LED flash facilities. Features supporting the camera is quite diverse, such as effects, white balance, face / smile detection, panorama, night mode, geo tagging, and multi shot. For the front camera, brings VGA resolution (640x480 pixels). Lenovo A60 can also perform video recording function, but unfortunately was not clear how the maximum resolution that can be achieved. As an alternative text input line, there are features Go keyboard, this feature offers several virtual keyboard options, such as the mode of landscape / portrait, to switch gesture. To support the functions of the entertainment, the Lenovo A60 is equipped with FM radio and music player feature, both features appear as the default standard in other Android consoles. For FM radio headset still requires a connection to run. Lenovo A60 has two browser options, namely the Android default default HTML browser and Opera Mini, both can run multiple browser tabs, and you can enjoy the thrill of pinch zoom. As smartphones are bundled with Telkomsel, there are two distinctive features of Telkomsel present, namely Telkomsel Mobi and m.telkomsel.com. In the package, you can enjoy free unlimited internet for 3 months. Because internal memory is limited, some applications can only be run with the support of memory card, such as the camera. In terms of specifications, of course there are many minus the Lenovo A60, but when weighed Rp1.555.000 of the selling price, the specs are immersed for Taiwanese smartphone is already passable. Lenovo A60 adopts MT6573 650 MHz processor, 256 Mb RAM and 220 Mb of internal memory. It's not the class turbo processor, but in trials 3 applications can run with pretty much perfect. One of the unfortunate, the dependence of the camera on a MicroSD card and a hotswap. Lenovo A60 armed with Lithium ion battery with a capacity of 1500 mAh. There is no official information about the ability of standby time and talking time. But in the trial, ranging from full battery condition, can last up to 48 hours in minimum usage conditions. You have finished reading Lenovo A60 Dual SIM Android Mobile and many articles about Tech Gallery in our blog this, please read it. and url link of this article is https://littlebitjohnny.blogspot.com/2013/01/lenovo-a60-dual-sim-android-mobile.html Hopefully discussion articles on provide more knowledge about the world of new tech gadgets.